I feel a tiny bit silly posting this "recipe", but honestly, sometimes these really easy, humble ideas are some of my favorites when I stumble across them on the internet. I don't love to cook, so anything that it mostly tossing ingredients together is right up my alley! This meal fills the bill-and it is a one pan wonder, so clean up is a breeze, especially since you don't even cook directly on the pan! My other favorite part of this is that all of the components are frozen, so it is easy to always keep the ingredients on hand. 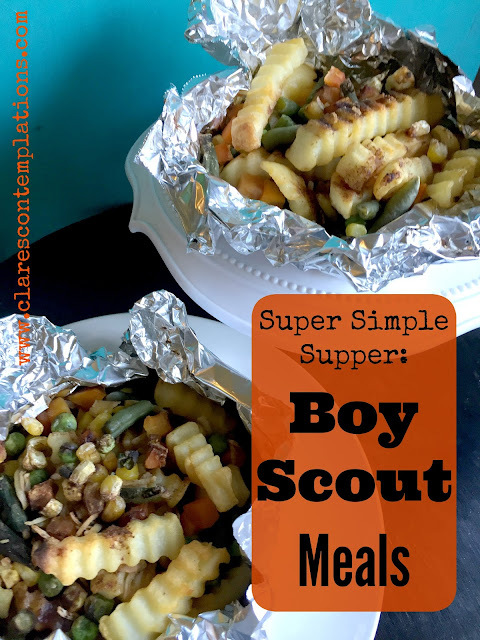 I have seen other takes on this dish elsewhere and it is called a variety of other names: hobo dinners, foil packet meals, but we always called them "Boy Scout Meals". 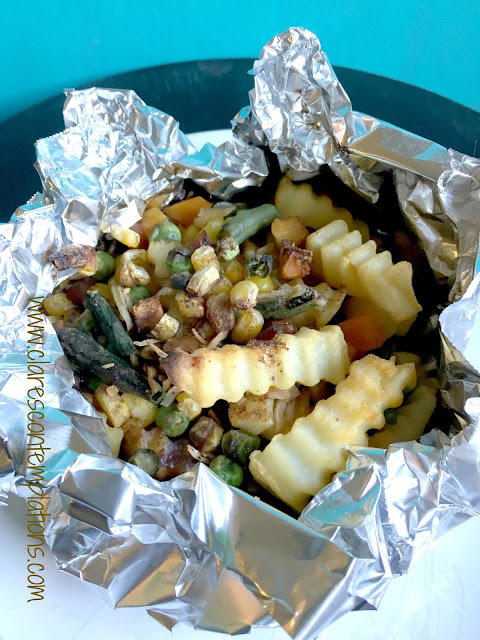 I know foil packet meals are popular for camping, but we always made these at home, in the oven. If you know me at all, you know I *don't* camp. The one time in all of our marriage that I threw a kicking and screaming fit (no, I am not proud of it) was the one and only camping trip that we took about three months after we were first married. Long story short, it had been a miserable trip: spiders the size of my hand (we found out later they were tarantulas), vermin in our food, rain, an un-level campsite, sunburns, mosquito bites, and the straw that broke the camel's back: a tornado was spotted several miles away, potentially headed towards our camp. I demanded we go home, a decision I do not regret. I do wish that I had perhaps been a little more adult in the manner in which I asked, but regardless, we came home and have never gone camping since! But you don't have to go camping to enjoy these easy, all-in-one meals! You only need a few ingredients and prep time is a matter of minutes. Preheat your oven to 400 degrees. Pull out a square of foil and place one of your patties in the center. And here's why I don't call it a recipe. You throw a handful of fries on top of the patty. Add roughly 3/4 cup of frozen veggies. Shake 2 tablespoons of the onion soup mix over the whole mess. Then, with no delicacy at all, scrunch (that's a professional cooking word, in case you weren't aware) the foil around the burger. Make sure it keeps all your goodies securely in, but leave it mostly open at the top. The goal isn't to steam the contents, but rather to keep the heat around the patty. Put your bundles on a cookie sheet. In all my years of making these, I have never had one leak, but I also have never split the foil. I use a jelly roll pan with sides so I don't have to worry, though. Place the meals in the oven and bake at 400 degrees. I don't want to be super precise with my times, I would estimate between 30-45 minutes, depending on the thickness of your patties. I usually set the timer for 30 minutes, and then check a patty in the center for doneness. I cook mine until they are no longer pink in the center. If your patties are frozen, that will also affect the cooking times. If they aren't done after 30 minutes, I check them every 5 minutes or so until they are done. It is fairly difficult to overcook these, but I still like to be on the safe side. Remove from the oven and serve immediately! I cover mine in ketchup, but Joel prefers A1. You can dump the contents on a plate, but I always just put the whole packet on my plate and eat straight off the foil. Since these are a protein, veggies, and starch all in one convenient bundle, I don't even serve a side! You could definitely pair these with a fruit or salad if that's more your style, though. And because you didn't even cook on the surface of your pan, clean-up is effortless! This meal definitely takes me back to my childhood. Which because of how quick and easy it is, I have time to reminisce about. ;) I think next to my crock-pot meals, this is one of my easiest meals, and fortunately for me, one of my family's favorites! My husband had been asking me to make this for several weeks, so he was thrilled. What's your most favorite easy "recipe"? This is a great first meal for children when they are first beginning to cook. It is one of my favorites for sure! You, Clare, might be interested to know that your Grandma Kaye introduced me to these. Next time you serve them, invite your mom.